Beach Mobility Manufacturing makes and sells what we rent! To learn more about the chairs available, please click below and see the lineup! We rent experiences, not wheelchairs! We now serve all over Florida from multiple locations including Jacksonville, Daytona, Palm Beach, Miami Beach, Sarasota, and more! Please select a beach from the menu above! At Beach Mobility Rentals, we are a team of compassionate people who understand your needs on a personal level. Every person in the company is personally connected to someone with a mobility assistance need. 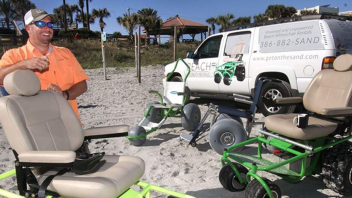 We serve the mobility-challenged community of all ages with our beach wheelchairs! Our renters include anyone with a reduced ability to walk on uneven, soft, or unstable terrain such as sand, deep grass, and dirt. You need not miss limbs or suffer paralysis to qualify to use our chairs. Arthritis sufferers, people with temporary injuries (leg in a cast? ), rehabilitation patients, people suffering with long term disabilities such as MS and ALS, and more all “qualify” to use the chairs. We don’t rent to people who have full normal functional use of their body. These beach wheel chairs are not a recreational toy and our business serves the people who need us most. We serve the mobility-challenged who have just as much right to enjoy their day in the sun as those who no affliction. We exist to serve a need, to enrich life, and to make our corner of the world a bit better for everyone. 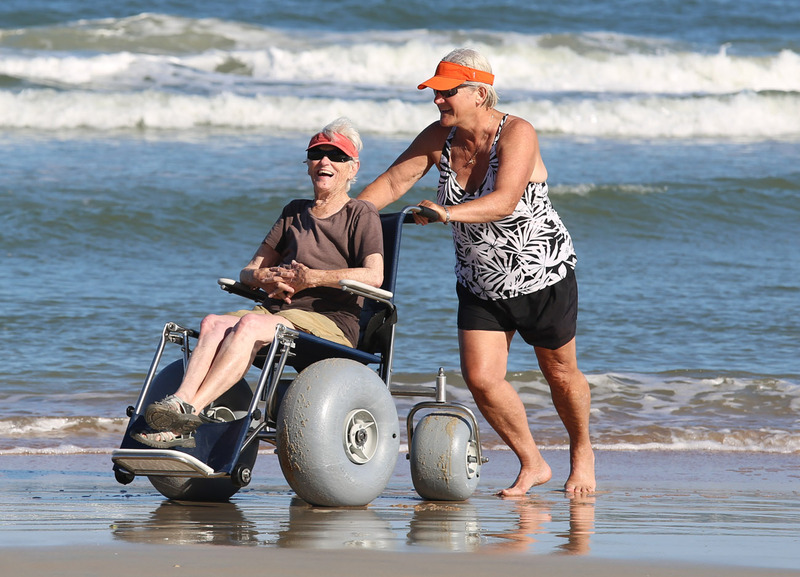 At Beach Mobility, we don't build, rent, or sell beach wheelchairs. We build, rent, and sell experiences. Long after the vacation is over, the memory of a day in the sun will live forever. And that is what separates us from everyone else. It's not about making a buck. It's about the privilege of participating in lifelong excellent memories. For some people with disabilities, the beach is off limits. But a man in Florida is trying to change that, and his business is booming. Check out more images on Beach Mobility Instagram. Greg, in two decades I haven’t enjoyed the beach like I did today. In the 90’s, I walked in search of sand dollars, and today it felt like I was walking and doing that again. Sitting in the chair, I was the same height as my wife Lea-An! With the powered chair, I have the freedom to choose where I want to go without having to ask to be pushed there. And it was great to be alongside my wife for a change, instead of having her always behind me pushing, having to turn around to see her face. This was a special day and I look forward to coming back to rent from you often! What an incredible feeling of freedom, and to be this close to the water is fantastic! So easy to maneuver, so comfortable to push, and this changes lives. It’s really great to experience the beach this way! Thank you so much! Dear Greg, I haven’t felt the warm waters of the Atlantic in many years, and this day was purely magic for me. Every return to the beach will include a chair rental from you. It was simply amazing! Thank you for this experience! Beach Mobility Rentals made my vacation perfect! I was pleasantly surprised when I met Greg on the beach with my daughter Sarah. He has compassion and understanding that drive him to providing a way for everyone to enjoy the water. Sarah was able to experience the waves and the beach instead of just watching from the sideline. The look on my daughter’s face as she experienced the waves was priceless. You are a blessing to many people. Praising God! Hi Greg Glad to know you and Beach Mobility Rentals! My Mom really enjoyed her experience on the unpowered all-terrain wheelchair we used on Christmas Day. She was as delighted as we were with the comfort of her ride and the ease with which she could get in and out of the chair. 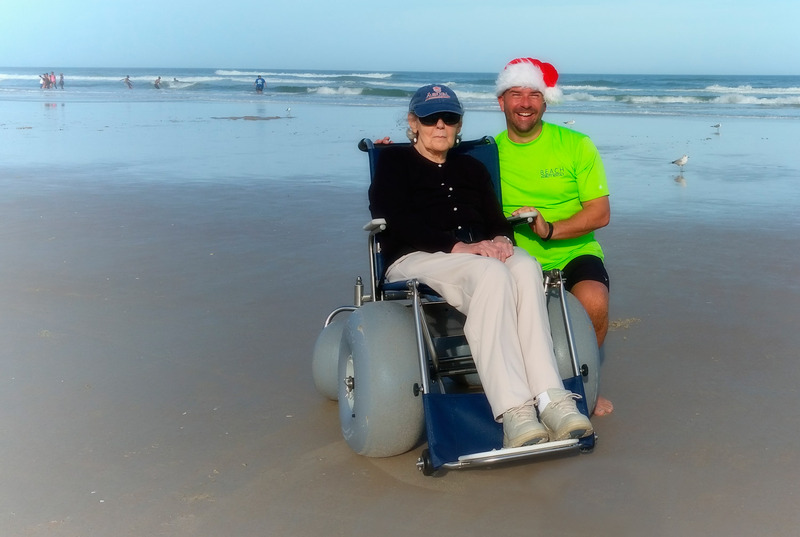 As you know, my Mom recently celebrated her 100th birthday, has mobility issues, and was a little apprehensive about the transition to the beach wheel chair. She was pleasantly surprised to find out how easy it was. We walked a little over 1.5 miles with no more effort than it would take to push a conventional wheelchair on a street the same distance. But – as you know – we had the added bonus of listening to the crash of the ocean, feeling the cool ocean breezes and chatting it up with all those tourists covered with oil. Thanks for this great experience. We’l be back! Being able to get on the beach and to be able to have the freedom of using a motorized beach wheel chair was the most fun I have had in over 5 years of being injured. I would definitely recommend this company to anyone who is a paraplegic. I would also recommend bringing an extra cushion to give you a little extra cushion if you suffer from skin issues. Overall, using beach mobility rentals was an incredible experience and I would 100% use them again on my next trip to Florida. Also, the owner is very friendly and was very helpful to me and my family. Thank you Beach Mobility Rentals! Hi, my name is Billy Fox. I have cerebral palsy. As I have gotten older, my walking ability had become very difficult. On the day of July 21,2018 I had rented one of your beach wheelchairs for the week to use at New Smyrna Beach Florida. I was so happy I did. The person that delivered it, explained how to operate it and maintain the battery charge. I was able to travel all over the beach and into town. I had so much fun riding around where I could not have walked. The beach wheelchair was very sturdy and rugged. I was able to ride up and down small curbs with no problem. There were some people who would say, "nice buggy", when I rode by. I can't wait until next year because we have reserved the same place on the beach again. So that means I will be renting one of your beach wheelchairs again. I can't wait for that also. Greg is so helpful and his prices are amazing! He really cares about the person not just the $$. I messed up thinking we were closer to Daytona then we actually were, Greg was so helpful with the times and pickups/drop off. I HIGHLY recommend this business.